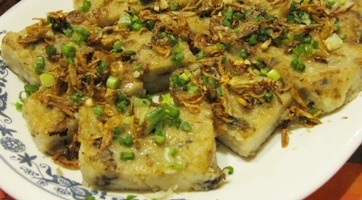 I got this recipe from my sister-in-law after I tasted the steamed radish cake she made. It was so yummy that I was determined to try my own hand at it. So I made a tray today and pan-fried some slices to serve over dinner. Just before serving, some spring onions and sautéed onions were added as garnishing. It was well received by my family and it gave me great satisfaction that so simple a dish generated such good reviews. I tweaked the recipe a little and here is my version. Enjoy! 1. Stir fry garlic with oil till fragrant. 2. Add dried shrimp, Chinese sausage and dried mushroom. Stir fry until fragrant. 3. Add shredded radish, water, seasoning and simmer over low heat for 10-15 min. 4. Lower the heat and add batter. 5. Stir until the mixture thickens. 6. Pour the thickened mixture into a tray. 7. Steam on high heat for 45-60 min or until chopstick comes out clean after inserting into the cake.